Lutron offers several shading systems with the same great benefits as Sivoia QS Wireless, including ultra-quiet, precision control, but with additional features. Browse through the other systems below. 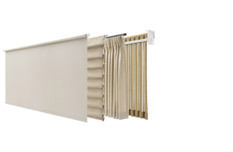 The Sivoia QS shading system offers precision control of daylight with near-silent operation, easy installation, and seamless integration with Lutron lighting controls, such as GRAFIK Eye QS and Quantum.